WHEN MARY HELEN SEAGO presented her thesis exhibition in the fine arts department of Newcomb College in 1961, she displayed sculptures in bronze and plaster of Paris. The bronzes became part of the Newcomb College Collection. Several other sculptures remain with her, including a striking relief sculpture hanging in her living room. Because of the limited number of pieces in this series and Mary Helen’s eventual move into painting, these early works are important markers in her artistic development. The theme of these abstractions reference birds and various aspects of flight, including lift off and destination. Titles such as Moon Sails and The Dance suggest a poetic sensibility that continues to express itself in 2019 in a different form and medium. I arrive at Mary Helen’s home for a conversation about her life and her art. A wide-open studio is filled with colorful large- scale paintings that catch my eye. These works appear to be in harmony with the springtime landscape of Southeast Louisiana. Mary Helen greets me in the gracious style of one born and raised in New Orleans. Her subtle accent is unmistakable and authentic as we discuss the modulation of color that creates mood and structure in her style of painting. 1700 in Northern England, Scotland and Ireland. Her ancestors came to Georgia, acquiring property and establishing themselves as plantation owners near Savannah before the Civil War. At the time, record keeping of business transactions and personal histories describing everyday life was a common practice. Many such records were destroyed in the Savannah Military Campaign that began with the burning of Atlanta and continued as Union General Sherman marched to the sea. Among the surviving records were letters documenting Mary Helen’s family before, during and after the Civil War, approximately a 5-to-6 year period. They are preserved today in historical collections at the University of Georgia and Tulane University. A family friend compiled the letters in The Children of Pride: A True Story of Georgia and the Civil War edited by Robert Manson Myers. It took him 10 years to complete the book, which received the National Book Award in History in 1973. Later, these documents became part of an epistolary novel published in the 1980s. Mary Helen’s interest in the arts apparently springs from strong roots. British painter and watercolorist, Edward Brian Seago (1910-1974), a cousin of Mary Helen’s father, was well known throughout Europe. His atmospheric landscapes and scenic water scenes were painted in the Late Impressionist Style and highly regarded by collectors. The Queen of England acquired one of his paintings for the Royal Collection. Mary Helen’s brother Robert Seago is a recognized painter and musician. Her brother John Seago “is a lawyer turned vintner. John loved science, and the challenge of growing grapes in Louisiana resulted in the founding of Pontchartrain Vineyards.” All three siblings now live on the northshore. Mary Helen’s latest paintings may be described as lyrical abstractions. The compositions she brings to this style evolved after years of painting floral subjects, most often a single flower in a powerful reference to nature. These earlier paintings are grounded, usually in contact with the edge of the canvas, to achieve a feeling of being rooted to the earth. An example from this period is the centerpiece of the permanent collection on display in the Atrium Gallery at the Christwood Retirement Community in Covington. 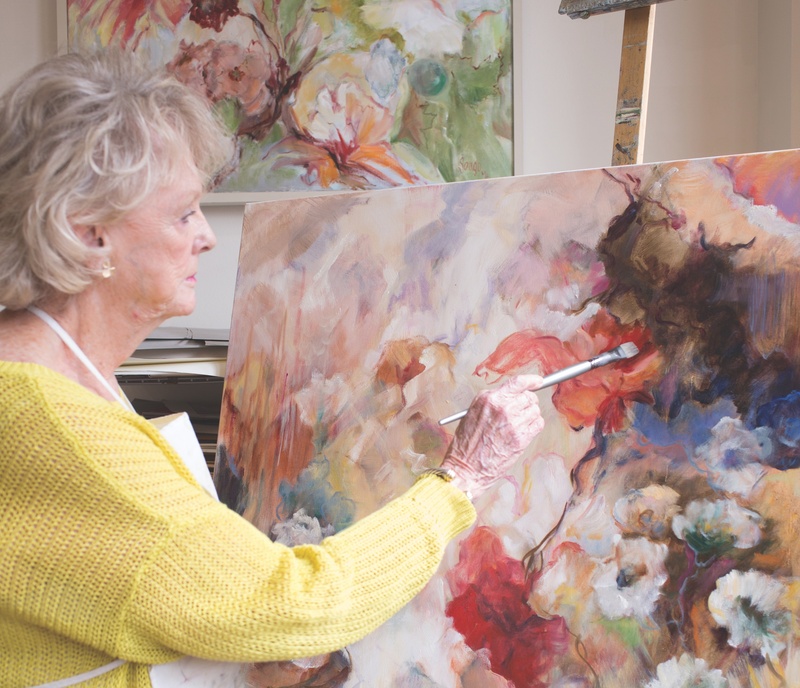 Mary Helen has worked with art consultants who successfully introduced her paintings to a wider audience in Louisiana, along the Gulf Coast and the southern region of the United States. View additional works by Mary Helen at Degas Gallery, 604 Julia St, Ste 101, in New Orleans; Armbruster Artworks, 502 Columbia St. in Covington; or seagoart.com.